Reprint. Originally published: New York: Farrar, Straus and Giroux, 2003. The collected work of America's pre-eminent post-war poet. 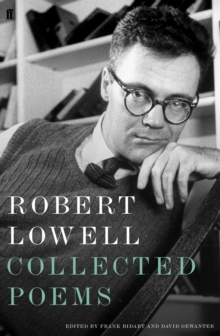 Edmund Wilson wrote of Robert Lowell that he was the 'only recent American poet - if you don't count Eliot - who writes successfully in the language and cadence and rhyme of the resounding English tradition'. Frank Bidart and David Gewanter have compiled a comprehensive edition of Lowell's poems, from the early triumph of Lord Weary's Castle, winner of the Pulitzer Prize, through the brilliant wilfulness of his Imitations of Sappho, Baudelaire, Rilke and other masters, to the late spontaneity of his History, winner of another Pulitzer, and of his last book of poems, Day by Day. This volume includes several poems never previously collected, as well as a selection of Lowell's intriguing drafts. As Randall Jarrell said, 'You feel before reading any new poem of his the uneasy expectation of perhaps encountering a masterpiece'. Lowell's Collected Poems offers the first opportunity to view the entire range of his astonishing verse.